In 1880 G C Haddon built a church (BN 39 p284) for the Gilberts’ Upperton estate, then under development. The nave was built first at a cost of £4000 and on the plan accompanying the ICBS application it is shown with aisles and a planned polygonal apse, whilst an early photograph (Elleray pl 91) shows a belfry on the east gable of the nave. 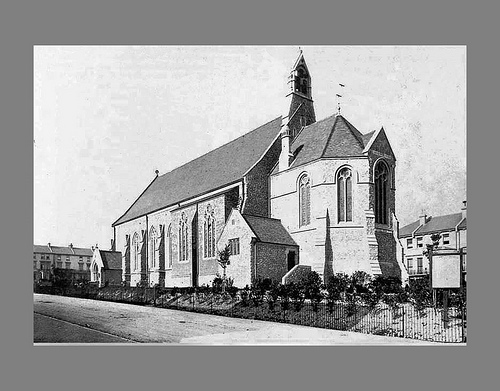 R K Blessley, H Spurrell and —- Field added vestries in 1883 (ICBS) and transepts followed in 1893. A vestry with a vault beneath for storage, designed by ‘Mr Merry’ (possibly an error for W H Murray, who was then Spurrell’s partner), was added in 1898, when further additions were planned (Arch J 8 p378). In the following year (KD), the sum of £9000 is given for the cost of the first part of the church, but this is more likely to apply to the entire structure. The reason Blessley and Spurrell (who were still in the town) were not chosen for the work in 1898 is not known, any more than why in the first place Haddon was chosen, since he came from far away. The church was bombed in World War II and though a contemporary photograph shows the walls still stood (in Brown), the remains were pulled down in 1955. The proceeds were used to build a new church at East Wittering, West Sussex, which retains the dedication and some fittings. Glass: Some is now reset in the narthex of St Richard, Langney, where questions about its authorship are discussed. Further glass by P Bacon is now in the west window of St Michael and All Angels, Willingdon Road. Monument: Brass tablet to Captain Oates (d1912) who perished with Captain Scott in the Antarctic and had worshipped here (ibid). Reredos: Sir J N Comper, 1896 (ibid). Part of this was rescued and placed in the new church of St Mary Magdalene, Coldean, Brighton.